Lab suppliers interested in marketing life science solutions and increasing scientific product sales may be interested in the latest funding news at the University of California, San Diego. According to the NIH RePORTER, the University of California, San Diego received an $11.3 million award to study Alzheimer’s in 2013. The University of California, San Diego receives a great deal of research funding every year from private donors, the NIH and the NSF. In 2012, the University of California, San Diego was awarded $395 million by the NIH. For a full list of departments receiving funding and awards, organized by department name, number of awards received and total funding awarded, please visit the NIH website. The NSF also awarded the University of California, San Diego $70 million in 2012. For more detailed NSF research funding information, please visit the NSF website. Biotechnology Calendar, Inc. is a full-service science research marketing and event-planning company that runs life science marketing events at top research institutions across the country. 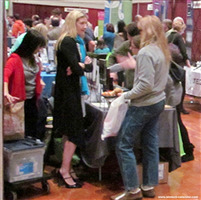 Science researchers interested in learning more about life science solutions love our events because they are able to talk about their latest research projects with lab suppliers and learn about new products and services while enjoying a free, catered lunch. Our trade shows are only a short walk away from the lab, making them convenient for researchers to attend. Exhibitors highly value our trade shows because we provide a place where they can meet hundreds of researchers in a short period of time. There’s no easier way to meet so many potential leads in just one afternoon. The universities at which we organize trade shows are also very well-funded, making the market an advantageous one to get to know. Biotechnology Calendar, Inc.’s professional services and casual atmosphere make it easy to discuss your company’s newest technologies and supplies and generate a great deal of scientific product sales leads. If you are a lab supplier interested in marketing your life science solutions and increasing scientific product sales at University of California, San Diego life science marketing events, Biotechnology Calendar, Inc. invites you to attend our semiannual San Diego Biotechnology Vendor Showcase™ Event, which is coming up on August 22, 2013. Last year, our San Diego Biotechnology Vendor Showcase™ Event attracted 723 attendees. 224 of these visitors were purchasing agents, professors and post docs, and 77 were lab managers. The attendees came from 69 different research buildings and 76 departments across campus. For more information on our San Diego Biotechnology Vendor Showcase™ Event, or to view more detailed funding statistics on the University of California, San Diego, click on the button below. If you are interested in marketing your life science solutions and university lab equipment at life science marketing events closer to home, we encourage you to view our 2013 calendar of events.